← Layoffs Planned? What’s An Employer Brand To Do? 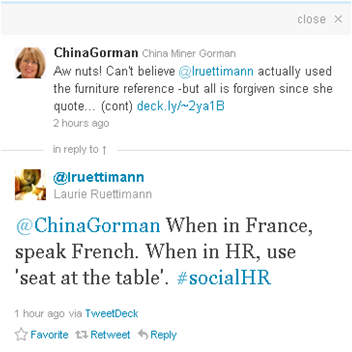 Normally, I agree with everything Laurie Ruettimann says. Not because I’m a robot, but because she’s right 99% of the time. .9% of the time we just see things through different lenses. And .1% of the time we just disagree. And this falls in that .1%. I think that when you’re in HR you have to speak the language of business. I think speaking HR in business is the kiss of death – or irrelevance, which is really the same thing. It’s not about furniture, it’s about influence. And when you’re influential you speak the language of those you influence. Business people are everywhere in organizations. They’re in Finance (where they speak finance and business). They’re in Marketing (where they speak marketing and business). They’re in Operations (where they speak operations and business). They’re in R&D (where they speak r&d and business). They’re in Sales (where they speak sales and business). They’re in IT (where they speak technology and business). Business people are most definitely at the top of the organization where the only language spoken is business. 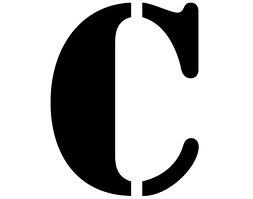 So if you want to influence the people at the top of the organization – all those people whose job titles start with a great big “C” — you have to speak to them in their language, not yours. The bottom line is that language is important. Using language your target audience doesn’t understand ensures that you won’t be understood. It also ensures that you will have no influence. None. Zero. So if HR is to be influential and interact with a certain type of furniture it has to be fluent in the language of business. Actually, I’m pretty sure Laurie Ruettimann will agree with me. Great post, China. I’m always shocked that HR doesn’t “have a seat at the table.” If 75% of an organization’s value comes from the people (according to Towers Watson), and “people” are considered to be the domain of HR, then why doesn’t the senior executive team see the value in HR coming to the table? I suggest HR needs to bring stronger metrics and reports to show progress (or needed areas of improvement) in a way the CEO cares about. Reporting statistics on the number of managers who failed once again to complete performance reviews in a timely manner isn’t going to cut it. What kind of metrics am I talking about? * More clear and easy identification of hidden high performers across the organization. All this table talk makes me think about Tabletalk pies and I like my pies, yum, yum, yum! Oh, what were we talking about? It is distracting. HR people talk so much about being at the table they become furnishings themselves, or waiters, or worse, the refreshment committee. Isn’t it a question about leadership and communication? There are good HR people going up the organizational chart, all the way to the top. Do they lose their voice when they enter the board rooms or executive suites? Do they ever come off the mountain and connect with the trench HR folk that are working to unite a profession within SHRM chapters and state councils and all over social media? I didn’t see the comments but wasn’t she being sarcastic? Well, I do think it was tongue-in-cheek. However, I believe we have to stop saying it entirely and refocus the conversation on action instead of…….whining. I did not hear the comments, but I am pretty confident that all this ‘seat at the table’ talk means someone needs to take a shot. Or two. I think she would agree. She is a talented writer and writers know if they want to get their point across they need to be understood. I’m sure she would as well China…I love the post, but don’t love the fact that there is no way for me to share the post from the post…..hmmm. She does. Share the post from the post: I’ll get my tech team on that over the weekend. Good suggestion.